Baruch Spinoza is one of the most influential and controversial political philosophers of the early modern period. Though best-known for his contributions to metaphysics, Spinoza’s Theological-Political Treatise (1670) and his unfinished Political Treatise (1677) were widely debated and helped to shape the political writings of philosophers as diverse as Rousseau, Kant, Marx, Nietzsche, and (although he publicly denied it) even Locke. 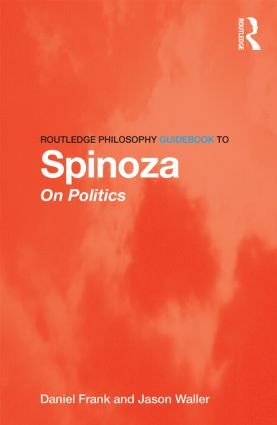 In addition to its enormous historical importance, Spinoza’s political philosophy is also strikingly contemporary in its advocacy of toleration of unpopular religious and political views and his concern with stabilizing religiously diverse democratic societies. the continuing importance of Spinoza’s work to philosophy. This book is an ideal starting point for anyone new to Spinoza and essential reading for students of political philosophy and seventeenth-century philosophy. Daniel Frank is Professor of Philosophy at Purdue University, USA and has published widely on Greek and medieval Jewish philosophy. Jason Waller is Assistant Professor of Philosophy at Eastern Illinois University, USA. He is the author of a number of articles on Spinoza, as well as Persistence through Time in Spinoza (2012).